Patient Access is a third-party provided service which works alongside the clinical software (EMISWeb) used in the practice. It allows you to view your current prescribed medication and your recorded allergies, a list of your previous immunisations and vaccinations, and of course booking appointments and requesting repeat medication. There are mobile apps for Android and iOS to make it easy to do these things at any time. You will need a username and password. This can currently only be obtained in person from Patient Services, and you must bring photographic identification before we can give them to you. Simply ask a member of the Patient Services Team for an "online access password", and they will generate a unique username and password. 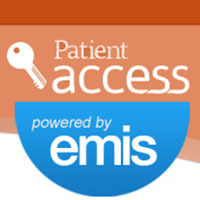 Then visit the dedicated Patient Access website - https://patient.emisaccess.co.uk/ - and follow the printed instructions.